Congradulations to Niall O'Carroll from Bruff who successfully graded for his 2nd Dan Black Belt under Grand Master Dominick Giacobbe. Niall went through a really tough evening for his grading and completed hours of tough training with Grand Master Giacobbe before taking to the floor to grade. 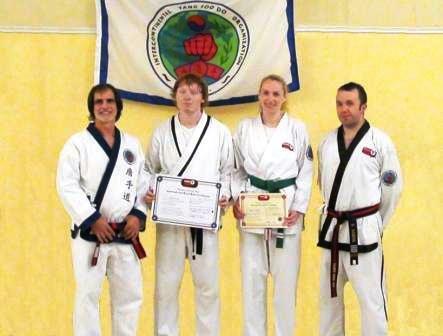 Niall has been a student of Master Fordes for many years and had put in a lot of training to prepare for his grading. Niall also helps out teaching classes with Master Forde at the Limerick City classes in Formula for Fun. Niall has also competed successfully in competition in the past winning First Place in the Tae Kwon Do Alliance for Black Belt Forms and 3rd for sparring. Also presented on the night with her grading certificate was Sylwia Malecka who successfully graded for 5th Gup Green Belt recently.